For the most up-to-date information, please contact individual housing sites directly. For family housing, please see Compass Family Services who provide their own monthly list. Or see the Mercy Housing list. San Francisco has set up a new web portal to replace the in-person affordable housing lottery. The new website includes the affordable housing lottery as well as below-market listings. This San Francisco Proposition will set up the “Our City Our Home Fund.” The fund will support housing and mental health services for homeless individuals, homelessness prevention, shelters, and hygiene centers. This statewide proposition–Proposition 10–would repeal the Costa-Hawkins Act. The Costa-Hawkins Act limits rent-control in California cities. If repealed, cities would be able to impose more rent-control regulations. Iris Canada just turned 100. She has lived in her home for over half a century. She is the last remaining African American in her building and one of a few African Americans left in a neighborhood that has become gentrified. African Americans are now only 3% of San Francisco’s population. The TIC owners in her building want to convert their units to condos, to increase their value, and put Ms. Canada in jeopardy of losing her home. She spent the last two years fighting her eviction and won the right to stay in her apartment. But the judge gave the landlord the right to demand legal fees – to the tune of $164,000. Ms. Canada has done nothing wrong but try to live out her life in the apartment and in the neighborhood that has been her home for 50 years. The landlord, the TIC owners, and now a SF judge are working to ensure that she is out, if she can’t come up with a ridiculous $164,000. She turns 100 on July 13th – some birthday present! Ms. Canada’s story is the story of how seniors are being mistreated in San Francisco’s hot real estate market, a market that is not driven by any sense of morality, only the racking up of profits. It is legally sanctioned elder abuse. We call on the owners of Ms. Canada’s unit, Peter Owens, Steve Owens and Carolyn Radische, to withdraw the legal fees and let Ms. Canada live the rest of her life in peace in her home. Anything less would be another scar on our city’s heartless removal of elders, people with disabilities, people of color and working families. And we should all be ashamed to let this happen. 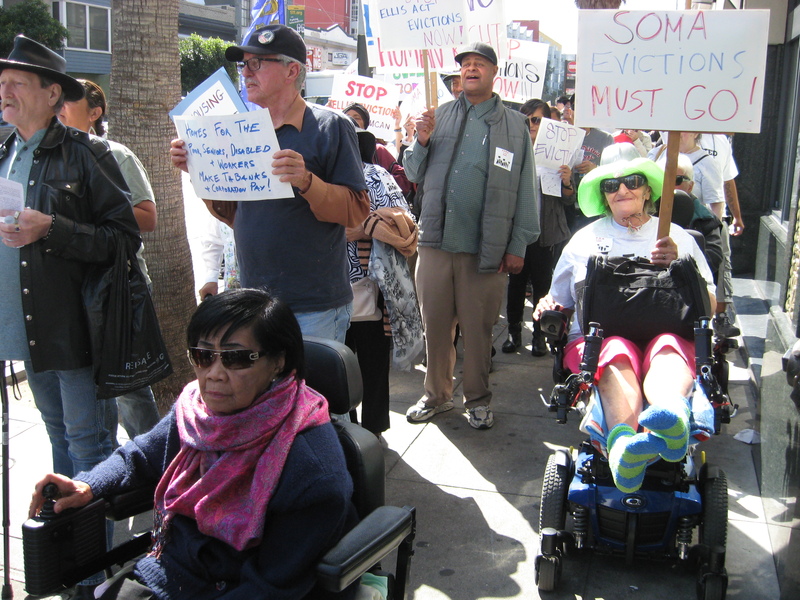 We are working hard to prevent evictions of seniors and people with disabilities in San Francisco. 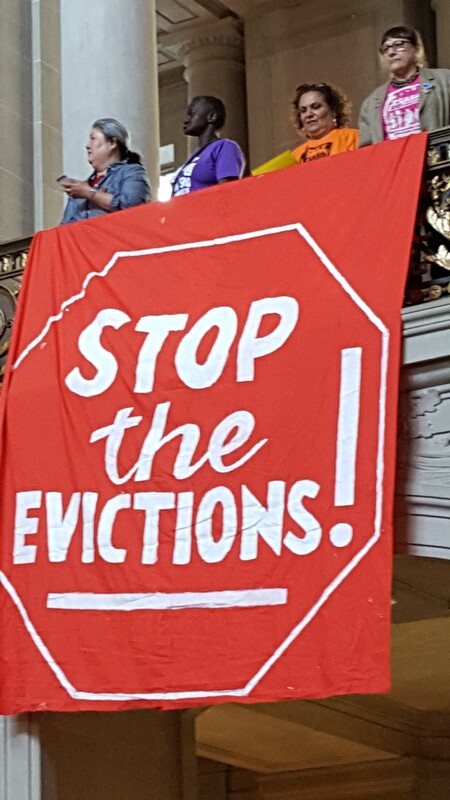 To learn about the eviction crisis, take a look at this report by the Anti-Displacement Coalition. 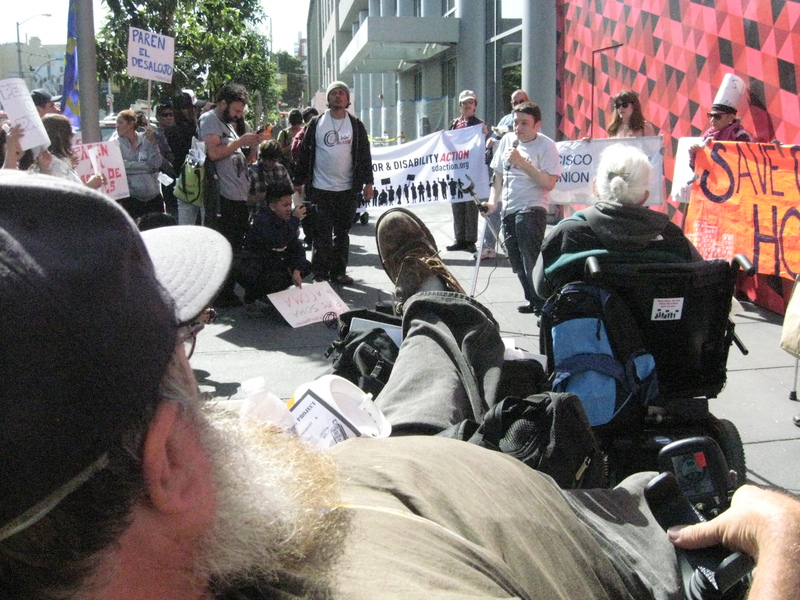 The Housing Collaborative meets on the 3rd Wednesday of every month, 1-3 pm, 1360 Mission Street, 4th floor. The SDA Housing Collaborative is a group of tenants, homeowners, community advocates, and representatives from non-profit and government agencies, all dedicated to improving housing opportunities for seniors and people with disabilities. We work together to preserve and create quality, affordable, accessible housing in San Francisco, by organizing to win change! Join us. The issue of non-working elevators in Single Room Occupancy (SRO) hotels has become increasingly important as seniors and people with disabilities find themselves isolated in their rooms, unable to carry out day to day activities. “Rising to the Top” is an SRO elevator justice project led by SDA with tenants from SROs in the city’s South of Market Area (SOMA), thanks to funding from a SOMA Community Action Grant. The workshop objective is to keep the issue at the forefront and to advocate for more resources to be allocated in remedying the problem. Below are a few testimonials from the elevator workshops. SDA has published a book of poems and essays by seniors and people with disabilities living in SOMA! Get your own copy now! 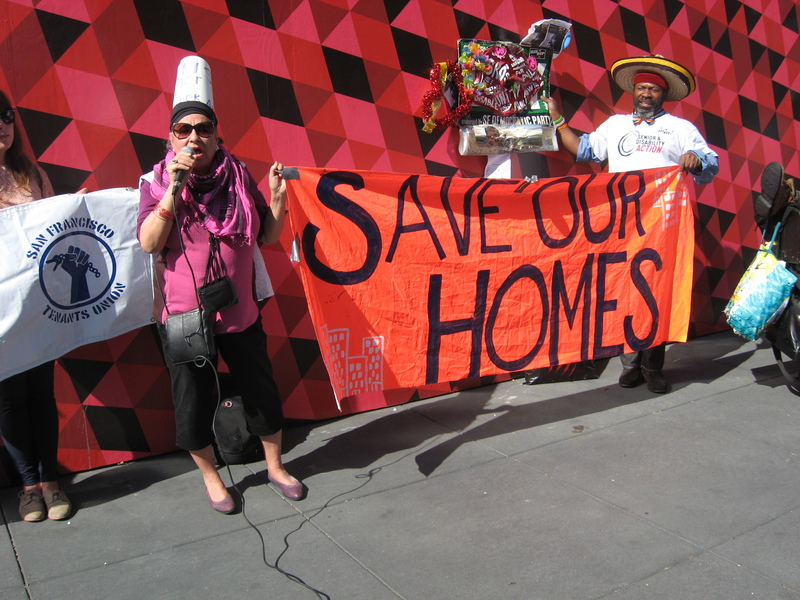 Join the fight to make sure elevators in SRO hotels and public housing work better. No one should be stranded out of their home or trapped in their apartment. Do you live or work in an SRO hotel or public housing? Take our Elevator Questionnaire so we can work to get the elevators fixed and better maintained! Please encourage others to fill it out too. Senior & Disability Action has been working to improve living conditions for seniors and people with disabilities in single-room occupancy hotels (SROs). With several organizational partners, we surveyed SRO residents and then put out a report in 2012. Click on these links to see the SRO Report Executive Summary and full report: Seniors and Adults with Disabilities in SROs. Mayor Lee committed to helping pay to fix elevators in Housing Authority buildings! Here is an interview from ABC news of SDA on this issue. S T O P E V I C T I O N S !